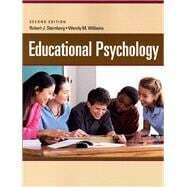 by Sternberg, Robert J.; Williams, Wendy M.
Written with an emphasis on helping readers understand and develop expertise in both teaching and learning, this book focuses on the science of educational psychology and the art of what it takes to become an expert teacher. Rather than glossing over theory and focusing primarily on skills, Sternberg and Williams offer a crystal-clear, in-depth presentation of both the science (principles and research) and art (practice and applications) of teaching. Principles are illustrated through the practice of expert teachers to encourage personal reflection by the reader. By helping readers discover what it takes to become expert students, as well as expert teachers, the book gives unique insight into the teaching-and-learning process. What Is An Expert Teacher? What Do We Know About Expert Learners?